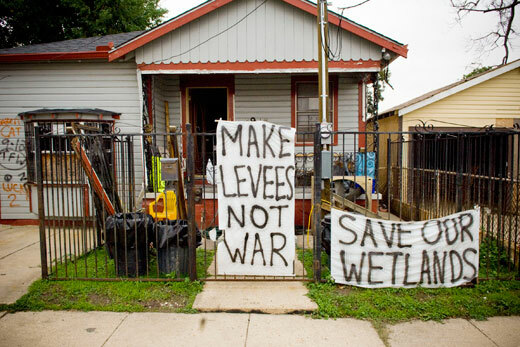 Emory's online Southern Spaces journal has partnered with the University of Texas Press to feature new, multimedia scholarship on the human impact of Hurricane Katrina. Southern Spaces, a peer-reviewed, online journal of regional studies published by the Emory University Libraries, and the University of Texas Press have partnered to produce an all-digital, multimedia venue for new and emerging scholarship on the ongoing human impact of Hurricane Katrina. Over the next several years, Southern Spaces will present adaptations of essays from the University of Texas Press' new Katrina Bookshelf Series. These online essays will feature extensive images, maps, charts, hyperlinks, and media components that go beyond the possibilities of the printed page. The Katrina Bookshelf Series is the result of a national project to bring experts together in a comprehensive program of research on the human costs of the Katrina disaster, the largest in United States' history. "No Place To Be Displaced: Katrina Response and the Deep South's Political Economy" by University of South Carolina professor Lynn Weber, is the first in this series of essays to be adapted for online presentation. "Having the scholarship available online greatly broadens the network of people who will see it and in turn generates more interest in the book itself. It also gets the information out in a more timely fashion, and hopefully into the hands of policymakers," says Weber, a professor of psychology and women and gender studies. The essay, adapted from "Displaced: Life in the Katrina Diaspora" (University of Texas Press, 2012), edited by Weber and Lori Peek of Colorado State University, explores the variety of challenges Katrina evacuees faced when they were relocated in 2005 to Columbia, S.C., such as housing, transportation and access to jobs and healthcare, in a state where social safety nets and aid are among the most limited in the nation. "Disasters will happen, but we do not give enough attention to how to plan for the displaced, and plan for their needs without devastating the resources in the areas where they settle," she says. "Hopefully what we are learning from Katrina can be applied to future disaster responses." For Southern Spaces, the partnership with the University of Texas Press represents a new development in the growing trend of digital publication for academic scholarship, says Allen Tullos, senior editor and co-founder of Southern Spaces, which focuses on the regions, places and cultures of the U.S. South and their global connections. The Katrina Bookshelf series editor is Kai Erikson, former president of the American Sociological Association. "Collaboration between academic presses," says Tullos, "many of which are under tremendous pressure and publishing fewer works, and online publications like Southern Spaces represents the future of scholarly publishing in the humanities, and is mutually beneficial for all involved."